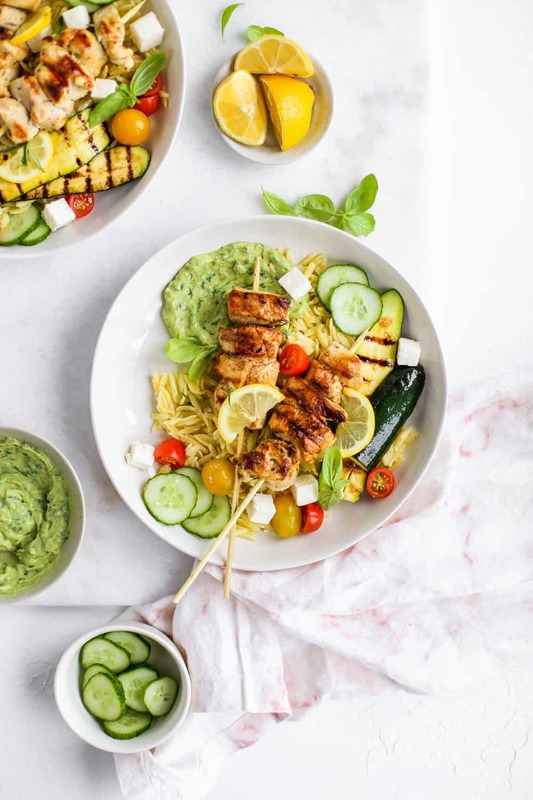 These lemon garlic chicken skewer bowls with orzo and green goddess sauce makes me feel like I am eating Chipotle… in Greece! 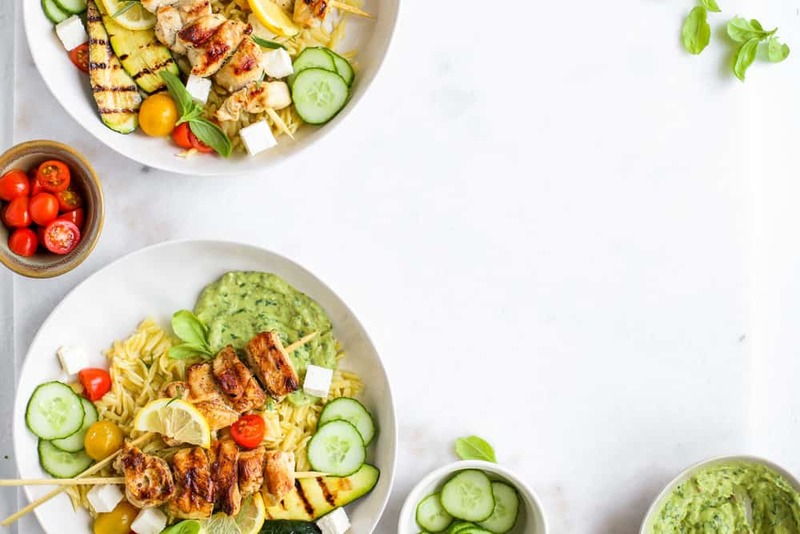 These bowls are broken down with similar base ingredients as chipotle, but full of mediterranean flavors! Hello! Currently reporting to you from my cozy little living room. Jared is sitting on the floor playing with Rascal and we are finishing up the last episode from Season 2 of 13 reasons why. It’s quite heavy for a Wednesday but a great show none the less. Lately, in the evenings I have been so thrashed that I can barely move from this spot. We recently got a new gym instructor and I feel like a limp noodle after the first few hours of the class. It’s a great limp noodle feeling but I haven’t felt this tired in a loooong time! I might also just be a little out of whack from my quick work trip to Colorado last week. I went for a super fast three day trip to Boulder, CO for a shoot with Purely Elizabeth. Nothing makes you feel more adult like staying in a hotel by yourself for a work trip. 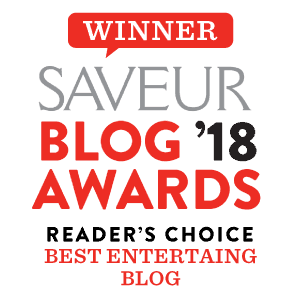 They are one of my favorite regular clients and I was thrilled to create some summer content with them. True story I have a little harder of a time with fall/winter content because I tend to style on the bright/whiter side but SUMMER! Summer content is just SOOO up my alley! We did lots of fun recipes filled in papaya boats and coconut shells. Purely Elizabeth focuses on the healthier and vibrant content so not only do I learn a ton about healthier options but we meet in the middle with style. 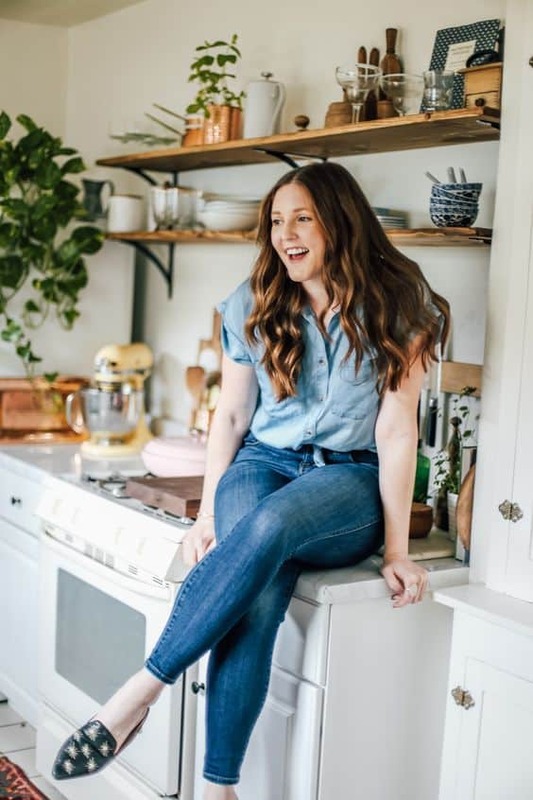 This week I sat down with Abbie and planned out the majority of summer content for The College Housewife as well! It’s always great to work with brands on their content strategy and work on your own. It keeps this whole job really fresh and new. I don’t know what I would do if I had a career that consisted of the same things over and over again. I’d probably go cray. My favorite thing about this bowls is that they come together so easily! You can have a quick and delicious weeknight dinner in under an hour! These are the recipes that I make in my own home and we genuinely eat them! Sooo.. I try and simplify them as much as possible! I am right there with you in respects of wanting a quick (but delicious!) dinner. I also just really like to eat things in bowl form! The base of these bowls is orzo pasta but you can use any grain/pasta! I think orzo is so nice because it’s like a combo of rice and pasta but you could use quinoa, farro or even riced cauliflower if you want to go low carb! 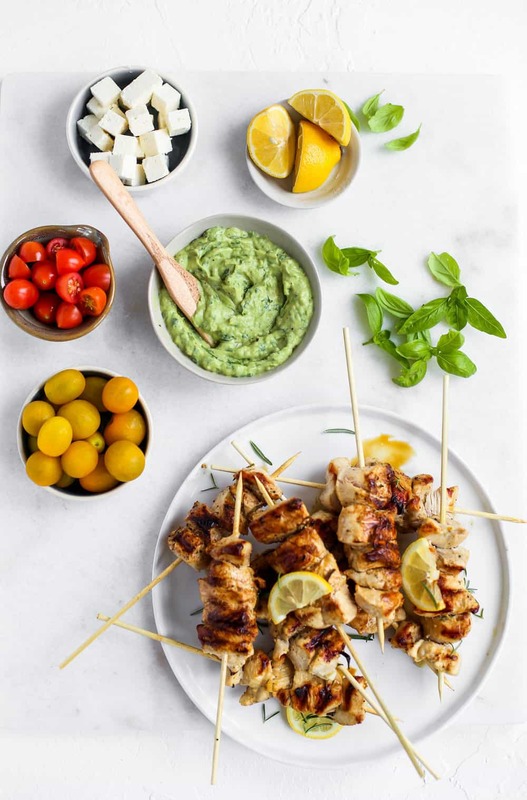 On top is a super simple marinated chicken skewer! I let the meat marinate for 30 minutes or so and then place them on a skewer. Just like the pasta, you could swap it out for shrimp, salmon, steak, etc! I use a grill pan on my stovetop but they are just as tasty grilled on the bbq! Lately, I can’t eat any protein without topping it with trader joes bottled green goddess sauce. Needless to say, I was inspired to try and replicate it! This green goddess sauce is a bit thicker and aids to the base of the bowl. There is more avocado and basil and less cilantro and greek yogurt. These bowls really do have a ‘chipotle’ feel to them! You can mix and match most of the ingredients! For veggies and more flavor I added fresh tomatoes, Persian cucumber slices and feta cheese blocks to top the bowls off! I also made a note during recipe testing that if you are into meal prepping these are a fantastic option! In a large bowl mix together cubed chicken, garlic, lemon juice, and minced rosemary. Place in the refrigerator for 30-60 minutes to marinate. While chicken is marinating prepare orzo pasta according to package directions and prep your tomatoes, cucumbers, and feta cheese blocks. To make green goddess sauce combine all ingredients into a Vitamix, food processor or blender for 30-60 seconds or until creamy. Place in the refrigerator until bowls are ready to serve. Place cubed chicken onto skewers. 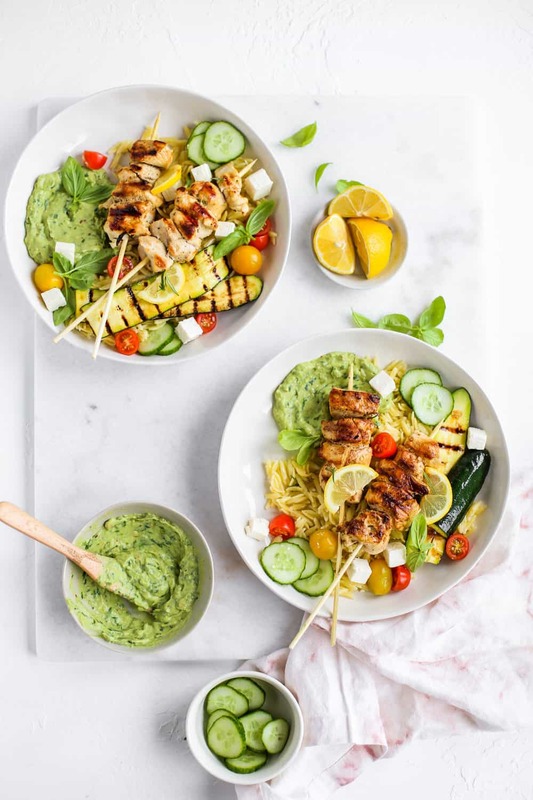 If using wooden skewers be sure to soak in water for 30 mins before cooking. Lightly coat bbq grill or grill pan with olive oil. Season skewers with salt and pepper and grill on each side for 3-4 minutes on medium-high heat. Also, grill zucchini slices for 2-3 minutes on each side and set aside. 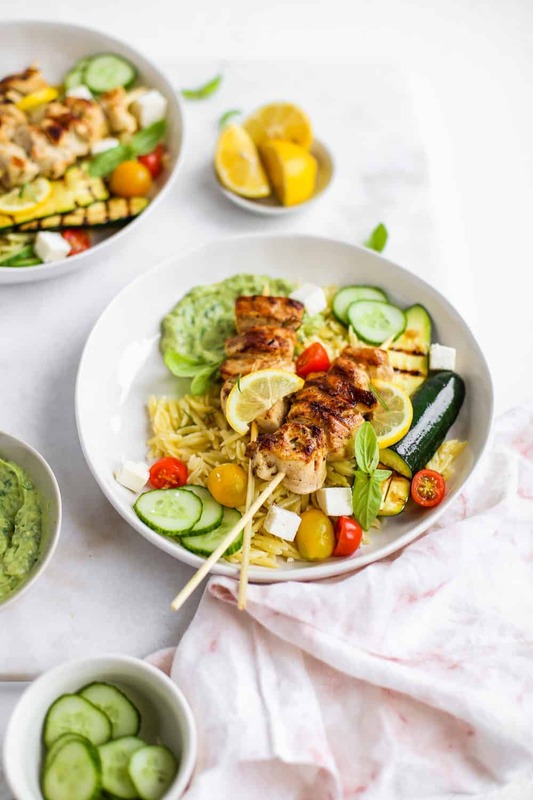 In a shallow bowl smear a thin layer of green goddess sauce, add 1/2 cup or so of cooked orzo, 2 zucchini slices, and 2-3 chicken skewers. Top with tomatoes, cucumbers, feta cubes and more fresh basil! How to make a Holiday Crudite Platter with Healthy Dips! Next Post DIY Wooden Herb Garden Planters for less than $100! I would love to try this recipe! But I don’t have a grill or a grill pan; what do you suggest as an alternative to cooking the chicken to get the same charred grill taste? Is there an alternative?